John Burroughs was one of the foremost nature writers at the end of the 19th century, and is credited today with being the inventor of the modern nature essay and a huge proponent of modern environmentalist movements. In his day, he was enormously popular, and traveled in the same circles as Walt Whitman, Thomas Edison, John Muir, Edward Curtis, Louis Fuertes, Henry Ford, R. Swain Gifford1, Edward Harriman, Harvey Firestone, etc. As the great wheel that is the canon of American Literature turned, he fell into relative obscurity after his death in 1921. Fortunately, he left behind a huge amount of writing. He also left behind some 53 journals, all of which are available in the Vassar College Library Special Collections. These journals have been transcribed twice already, once by Clara Barrus, the woman who took care of him in his fading years after his wife Ursula died, and once again by his granddaughter Betty Kelley. 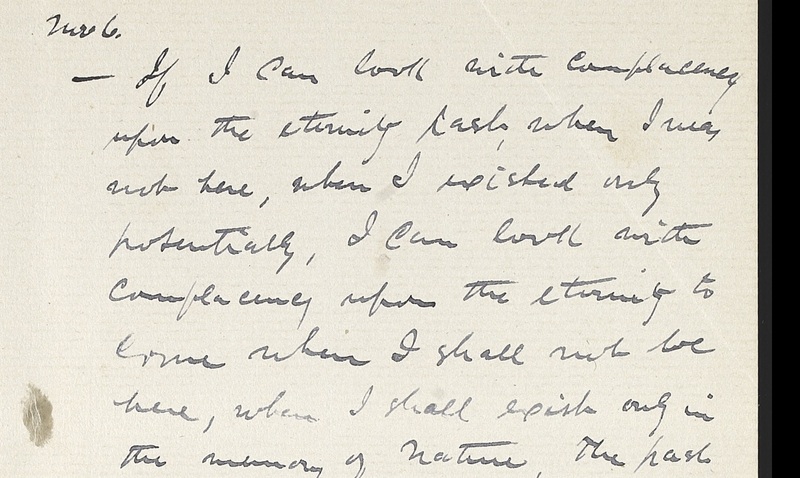 While these transcriptions are invaluable, full of information, and make clearly available Burrough’s often cryptic handwriting, they also have their downsides. Both of these transcriptions were highly edited, punctuation added, spelling corrected, and only selections published. Essentially, until the advent of my project (thanks to the work of Dr. Jeff Walker), these journals were available only in the glimpses that Clara and Betty felt appropriate. My voyeuristic research scholarship comes from a grant Vassar received to scan these journals in toto, all 3,300 leaves. I essentially transcribe these journals while staying as true to Burroughs word as possible. These transcriptions are then uploaded to a website [http://www.hrvh.org; search “John Burroughs” and select one of the journals] in which one can view an extremely2 high quality scan of the journal page. Thus, for easy legibility, my transcription is available alongside the image of the real thing. In short, my job is to carefully read the personal journals of a great, wise old American author. His journals are extremely interesting. He is constantly noting the weather, and changes he perceives with the seasons, trees, animals, etc., but more interesting to me is his musings on what makes good writing, who the bests authors/poets are, the dual nature of the soul and the body, the place of science and religion, Darwin, his visits with Walt Whitman, his troubled relationship with his wife — I’ve managed to find a way to get paid to study! For the remainder of my project (my goal is to transcribe a decade of his journals this summer, the next student will tackle the following decade), I’ll be publishing his gems of wisdom on my blog here, and perhaps commenting myself on the words of the great Naturalist. 1 Whom I will be writing my Art History these on. 2 By “extremely”, I mean 8 megabyte image files that you can zoom in so close, the grain of the paper is visible, any palimpsest discernible, and one might argue that you couldn’t get better resolution even if you had the actual journal sitting in front of you.